Report your option trades on Form 8949 and Schedule D.
No matter what type of options you trade, the capital gains and losses must be disclosed to the IRS. The IRS changed its procedure for reporting option trading in 2011. Investors must now list each short-term and long-term trade on Form 8949, and transfer that information to Schedule D. Options traders do not receive 1099s and must keep accurate records of each transaction to ensure the Schedule D is correct. Gather your brokerage statements and put them in month order. Match up each buy and sell trade through December 31. When finished, separate them into short- and long-term trades. Options you held for less than a year are short-term assets, while those held longer than 1 year are long-term assets. 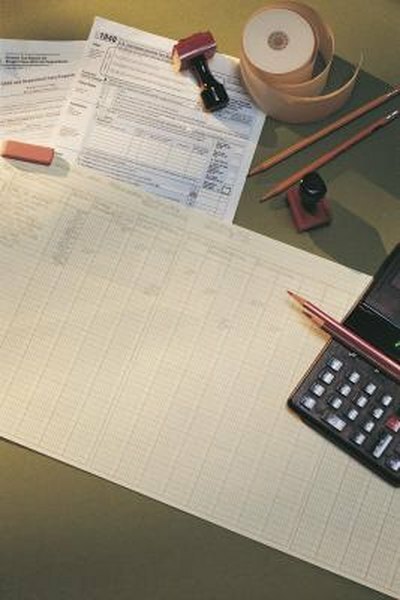 Go to the IRS website and print out a copy of Schedule D and Form 8949. Start with Form 8949 and fill in your name and Social Security number at the top of the form. Next, check one of the three boxes that reports 1099 basis. Since you did not receive a 1099, check Box C.
Report your short-term option trading in Part I on Form 8949. On line 2, enter a description of the property in column a. Move to column c and enter the month, day and year you purchased the asset, and in column d, enter the month, day and year you sold the asset. If you shorted the option to open the trade, the date in column d will be earlier than the date in column c. If the option expired, enter that date in column d. Enter all short-term trades in this manner. When finished, go to line 2 and enter the totals for column e and f. Enter your long-term trades in Part II the same way you did in Part 1. Start filling in Schedule D by entering your name and Social Security number at the top of the form. Move down to Part 1, line 3 to report your short-term option trades. Transfer the amounts you entered on Form 8949, line 2, columns e and f, to Schedule D, part 1, line 3, columns e and f. Now subtract column e from column f and enter that amount in column h. Repeat the procedure for your long-term option trades in Part II. Keep precise records of all option trades and reconcile your records against your monthly brokerage statement. Options classified by the IRS as 1256 contracts are not reported on Form 8948 or Schedule D. Option 1256 contracts are marked to market non-equity options and dealer equity options and are normally traded by securities dealers.